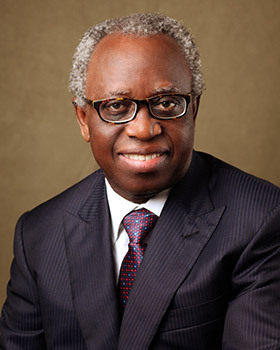 Chief Joseph Akpieyi is the Chairman of ARCO Group Plc. A highly respected personality in the oil and gas sector, Chief Akpieyi was educated at Government College, Ughelli; University of Ibadan; and University of Surrey, Guilford, United Kingdom earning degrees in Chemistry and Chemical Engineering. He also had academic stint at Columbia University, New York, USA. Chief Akpieyi has operated in the energy sector for over 40 years. At various times between 1965 and 1980, he was a Petroleum Engineer, Head, Refining and Marketing Division all at NNPC. He was appointed General Manager/CEO of Nigerian Petroleum Refining Company, Port Harcourt (now Port Harcourt Refinery) between 1980 and 1985, General Manager, Pipelines Operations Division at NNPC between1985 and 1988 and was made the first Managing Director/CEO of Warri Refining and Petrochemicals Company Limited. He served in this capacity between 1988 and 1990. Chief Akpieyi was the Managing Director of National Engineering & Technical Co. Ltd (NETCO/Bechtel Joint Venture) for 17 months between August 1990 and 31st December, 1991 from where he went on voluntary retirement. A stickler for quality and excellence, Chief Akpieyi was called on several occasions during his period of service at NNPC to perform various difficult assignments. He was Representative of Ministry of Petroleum Resources for appraisal and selection of site for Nigeria’s second refinery, (1973); Chief Negotiator of Offshore processing Scheme (OPS) (1974); Member, committee on Joint venture with Shell Petroleum (now Conoil Plc), (1974-75) Chief Negotiator for Esso (Unipetrol) take-over, (1975); Chairman, Committee on Capital Funding and Profit Orientation for NNPC, (1986); Chairman, Petroleum Equalization Fund Management Board, (1977 – 85), etc. A Western Region Scholar (1954-59 and 1962-65) as well as British Council Scholar (1967-69), Chief Akpieyi has received numerous honours/commendations for his service to the oil and gas sector. Amongst others are Merit Certificate Award, NPRC Board of Directors for leadership excellence (1983); NNPC’s MD/CEO commendation on Pipelines and Product Marketing Division Management for management excellence (1985); NNPC’s MD/CEO Commendation on Special Task Force on Pipeline Phase I Financial Obligation for integrity and objectivity (1987); etc. Chief Akpieyi is a fellow, Nigerian Society of Engineers; Fellow, Society of Chemical Engineers; Fellow, Chemical Society of Nigeria; Fellow, Nigerian Institute of Directors; and Fellow, Institute of Quality Assurance of Nigeria; Member, International Register of Certificated Auditors (ISO 9000:QMS 2000 Provisional Auditors); Member, American Society for Quality; amongst several professional associations. Chief Akpieyi has to his credit over 25 seminar papers, lectures and books on several areas of the oil and gas sector as well as quality management. He is the CEO of Trithel International Company Ltd, a 6-Sigma Quality consulting company. He is also the Chairman and/or Director in several companies including Intercontinental Registrars Limited, Air Separation Nig. Ltd, Sowsco Well Services (Nig) Ltd and O’Secul Nig. Ltd.